At Hudson Orthodontics, we have one mission: help you achieve a smile you feel truly proud to show off. As a leading orthodontic practice serving Muscle Shoals, Tuscumbia, Florence, Sheffield, and the greater Shoals area, we're proud to provide a wide range of convenient orthodontic treatments to our patients. But whether you straighten your teeth with braces or Invisalign, you'll still have to finish your treatment the same way: with an orthodontic retainer. When you get your braces off or finish your clear aligner treatment, we know you'll probably be ecstatic – but you're not out of the woods yet! After the active phase of your treatment, you'll enter the retention phase, and this is just as important for the outcome of your smile. Wearing your retainer will help your smile last you the rest of your life. So why is a retainer necessary? When you finish your treatment, your teeth will be in a new alignment, but the ligaments and tissues that support your teeth won't have adapted to that alignment yet. This means that left to their own devices, your teeth will drift back to their original locations and erase your hard work! A retainer gives your mouth time to adjust to the new alignment, helping to safeguard your smile for a lifetime. Hawley Retainer: The most common type of retainer, the Hawley is made from a piece of molded acrylic with wires protruding from the sides. The acrylic fits onto the roof of your mouth or your bottom gums, while the wires hold your teeth in place. 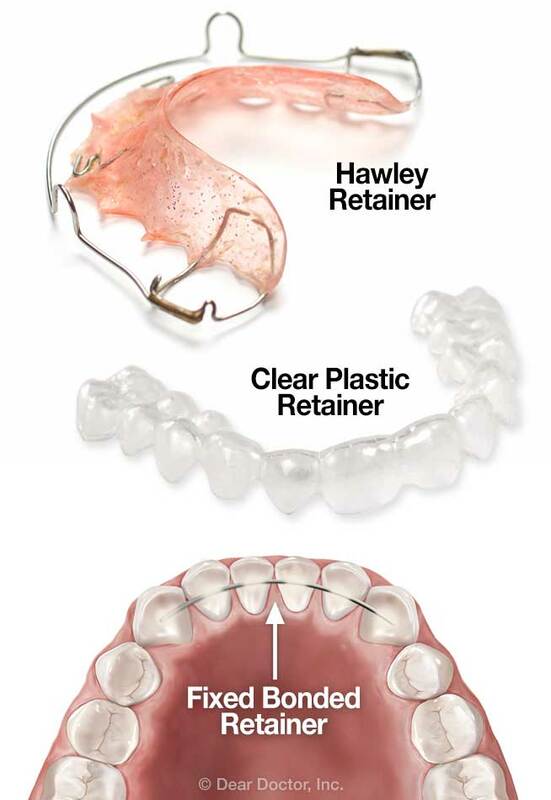 Hawley retainers are durable, cost-effective, and easy to take out, making them a great all-around retainer. Essix Retainer: The Essix, or clear aligner-type retainer, looks almost identical to an Invisalign aligner. It's made from clear plastic molded to the shape of your teeth, and unlike the Hawley, it fits directly over your teeth to hold them in place. Clear aligner-type retainers are almost impossible to see when worn, making them a great option for patients that need to wear a retainer 24/7. Fixed Retainer: Finally, fixed or bonded retainers offer another form of protection. These retainers are made from a metal wire that's cemented to the back of the lower front teeth. As the name implies, fixed retainers aren't removable, but they're also invisible and convenient to wear. These retainers are excellent for patients with a high risk of teeth regressing to old positions. Just like starting braces, starting retention treatment often involves an adjustment period. You may notice your mouth creating more saliva for the first day or two, and you may notice a change in your speech – however, both of these will disappear with a little time. At first, you'll likely need to wear your retainer 24/7, but eventually we'll give you the OK to wear it only at night. Eventually, you can wear your retainer just a few nights a week. Just like your braces, you'll need to take good care of your retainer. Using a soft toothbrush with a few drops of mild liquid soap is a great way to clean almost any retainer. In addition, you can use denture cleaners to give your retainer a deeper clean. If you have a fixed retainer, try using floss threaders or a proxabrush (pine tree-shaped brush) to clean underneath the wire. In addition to cleaning, we strongly recommend that you always use your retainer case when carrying your retainer. We can't tell you how many times a patient has accidentally thrown away their retainer after wrapping it in a napkin – and that's an expensive proposition! Your retainer case will protect your retainer from damage and warping, as well as help you remember to take it anywhere you go. With proper use and care, your retainer will help you maintain a beautiful, healthy smile your whole life long – and if you're ready to start towards a new smile for yourself, we'd love to help. Contact us today to learn more about the treatments we offer and schedule a consultation at our Muscle Shoals, AL office. We look forward to hearing from you, and we're excited to help you achieve the smile of your dreams!